The word "awesome" gets thrown around a lot, but I think we as a culture have lost track of its real meaning. Originally, the word meant "awe inspiring," and Dictionary.com defines "awe" as "an overwhelming feeling of reverence, admiration, fear, etc., produced by that which is grand, sublime, extremely powerful, or the like." Nowadays, "awesome" functions as a synonym for "cool" or "impressive:" When someone says a game is awesome, they're really saying that it's great, and generally are not implying any existential or emotional significance beyond that. I bring this up, because I don't want to be misconstrued as generic or uninspired when I say that Journey is an awesome game. In the most classical, archaic sense of the word, Journey is a beautiful, evocative and unequivocally transcendental experience. A big part of what makes Journey so emotionally powerful is how concise and delicately metered the narrative is, although I expect Journey's plot arc often to be interpreted as brief, rather than brilliant. 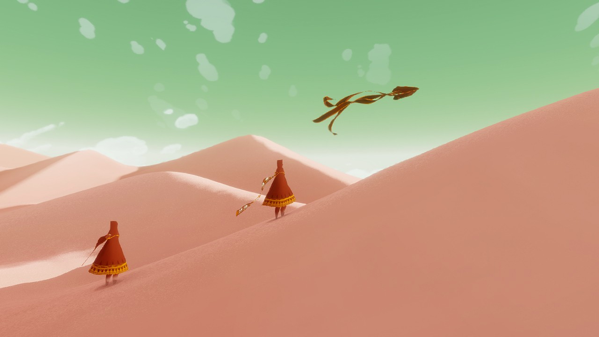 At roughly two hours long, Journey is indeed shorter than the average game, but that's because it doesn't need to be any longer. As a two-hour jaunt, the game remains consistently engaging, and the player never has a chance to come down from the visceral high brought on by traversing Journey's unimaginably breathtaking world. There's no filler, no dilution, nothing that isn't entirely and absolutely worth seeing. Journey's length means that it can be consumed in the most effective, powerful way possible: Without ever having to stop. The game's presentation is also unconventional in that, from stem to stern, there is absolutely zero dialogue. Much like Journey's length, this design omission allows the world to speak for itself and lets the narrative avoid obfuscation caused by dialogue or embellishment. Such minimalistic game design created an emotional bond between the me and the world; since nothing is defined, everything from the character's gender and purpose to the significance of the places (s)he visits was filled in by my subconscious. And when I say subconscious, I mean subconscious. Not once did I find myself deliberately trying to decode or understand where I was, who I was or what was happening. I just got it, but what I got will likely be very different from what someone else gets, because like all works of art, Journey is a reflection of the person interpreting it. It's pure and intrinsically personal. As cerebral as it can be at times, Journey is primarily an aesthetic experience that relies entirely on its art design and musical score to communicate the mood and character of the world's various stages, and it's in this way that it truly sets itself apart. My entire first playthrough was spent in slack-jawed amazement at the majestic, awe inspiring and staggeringly beautiful succession of locations that make up the experience. Moving through the world and experiencing its landscape through brilliantly scripted camera angles cannot be sufficiently praised within the narrow confines of the English language. Similarly, the screenshots in this review and elsewhere on Joystiq do not do Journey's cinematography a tenth of the justice it deserves. Seeing the sunlight reflected off the sands of a sunken city filled me with a stirring, deeply-rooted and exuberant joy. Never in my life have I been so powerfully moved by a game's visuals. 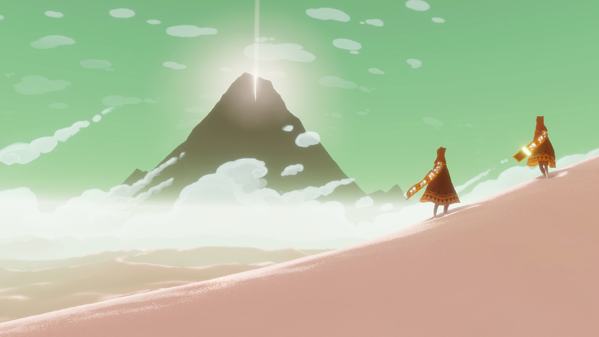 There's also a delicate synergy between Journey's cinematic direction and the immaculately composed score by Austin Wintory. The soundtrack is just as vital as the visuals in eliciting an emotional response from the player. I lost count of the number of times Wintory's delicate, subtle interpretations of the world gave me chills. That rewarding, visceral sympathy between the game's events and its soundtrack is amplified by its equally rewarding locomotion. Movement across the sand feels natural, which is an impressive feat considering the largely impossible way the character surfs down inclines and across planes, guided by the desert winds. The character's unique brand of physics makes perfect sense in context with the rest of the world, though, and the simple act of moving is one of the most enjoyable parts of this game. Calling out to a swarm of cloth pieces, having them launch me from one platform to the next still makes me smile, and it always will. It's a good thing that navigation is as delightful as it is, since there's not much else to the actual "game" part of Journey. There are a few puzzles near the very beginning that educate players on how to use their mystical-cloth-activating vocal ping, but those cease very quickly. There's also no combat to speak of, as the character has no offensive abilities of any kind. It sounds like it would get boring, but again, the game's length keeps that from being an issue. These are just more examples of Journey's minimalistic design philosophy; movement is the game, any other mechanics would get in the way and dilute the experience. Whether the player travels the breadth of Journey alone or with a companion has a profound effect on the overall tone of the trip. My first time through, spent entirely on my own, was colored by a phenomenally vivid sense of isolation, similar to what one experiences in Limbo, although nowhere near as bleak. My utter solitude enhanced the existing desolation inherent to the environments and focused the experience on the relationship between myself and the world, its exploration and my existence in it. My second journey, however, was spent with a companion. The isolation I had felt previously was replaced by a legitimate sense of camaraderie and affection for the duplicate of myself I had found in the desert. The game stopped being about me and started being about us; focusing the experience on the relationship between my companion and me, the literally unspoken bond we shared, our quest to reach the mountain and, above everything else, our desperate need to stay together. For those two hours, we were all each other had in the whole of existence. In hindsight, a lot of the emotional attachment I felt for my friend was induced by the game's lack of verbal and written communication between players, apart than the vocal ping used to activate cloth. Similar to how this lack of dialogue shaped my interpretation of the overall story, the fact that my friend's little noises never translated to anything meant that they could mean everything. I would bleep twice to ask "Ready?" and receiving two bleeps in return clearly indicated an emphatic "Ready!" in reply. Communicating wasn't something I had to actually think about; I had no question as to my friend's motivations or the character of their personality. They were a blank slate, projected upon by my own needs and preconceptions and, as a result, became whatever I needed them to be at the time. Neither experience, be it alone or with a companion, was intrinsically better than the other. Both were surprisingly emotional epics that affected me in ways I didn't know a video game could, and I sincerely hope that everyone is able to play through both psychological sides of the game. 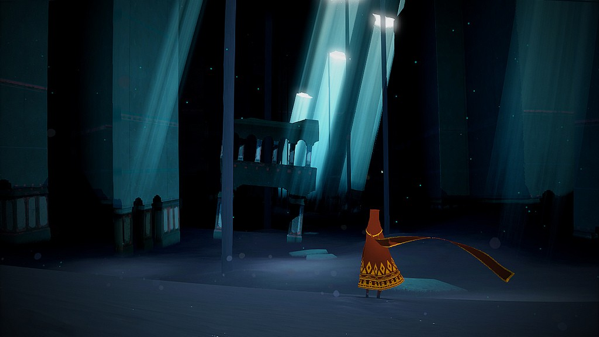 This review is based on the final version of Journey for the PS3, provided by thatgamecompany. Journey will be available on PSN starting March 13 for $15.